Sisterlocks Dread Extensions done in one day. 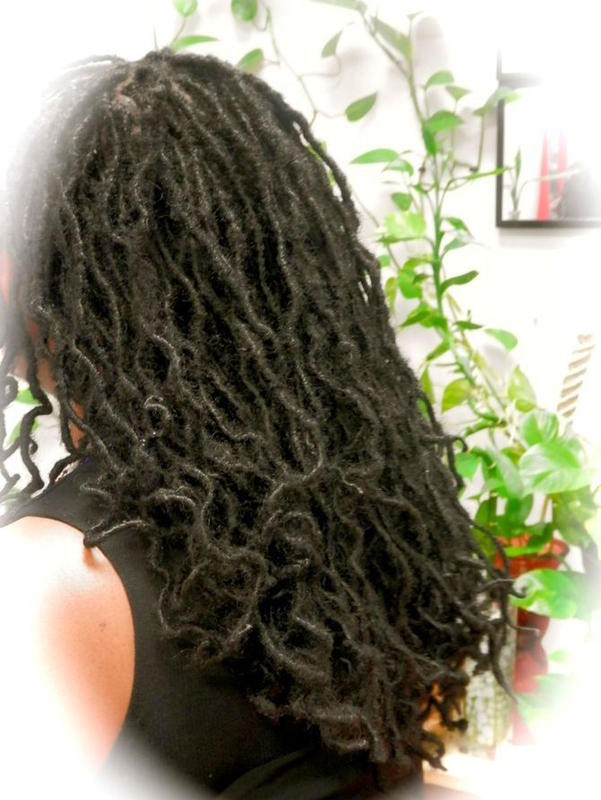 Have you ever wanted to go Natural and start Sisterlocs which are the smallest form of dreadlocks. However, you just didn't want to go thru any ugly stages or having to cut all your hair off to start all over. You just want that look right away. 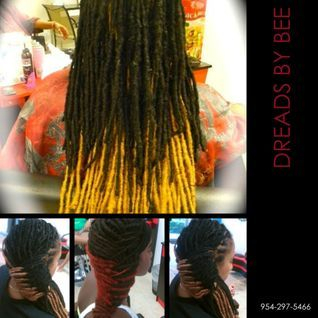 Well we have the solution for you at DreadsbyBee aka BraidsbyBee. We start Sisterloc Instant Dread Extensions which bypass all the ugly stages and will save a lot of time and rough stages of going natural. meaning Bee is raw and will be real about your issues. Bee™ informs the possibilities are and, what options she can recommend and not only recommend but also execute the job. To find out the labor cost and repairs that will be done needs to be broken down for each individual. All situations are always different. Each persons documents are reviewed and then recommendations are made. This consultation can be done via text, email, FaceTime, or in Person. All consults are documented in form of an appointment and will be documented for future visits. This idea was invented by Benite Corion aka Braids By Bee™ and was first an option to repair natural dreadlocks and create Locs to fill in areas that needed filling in. Then one day someone ask can I start there SisterLocs on there hair but didn't want to cut there hair and start from scratch. The clients hair was permed straight and was only natural for about 3 months. She Saw what I did on Caucasions hair and was confident that I can start her journey for her. Clients started asking about fixing issues like bald spots, edge being missing or thinned out and fell out. 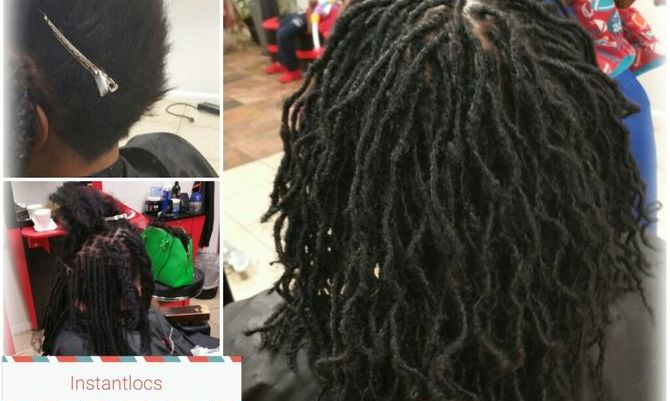 Some clients had there dreads saved to re-attach, or some had it done but was not professionally put back together so its detectable. Some clients needed me to create dreads from scratch to fill in areas that was missing. 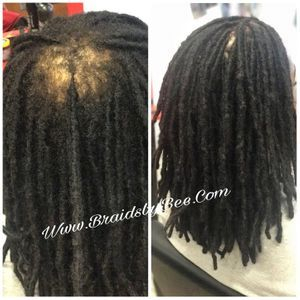 Clients starting asking Bee can you fix this, how can this be covered, Bee what can be done about this and Bee came up with the Idea of InstantLoc Dread Extensions thru trials and errors of using multiple different options to repair Locs. 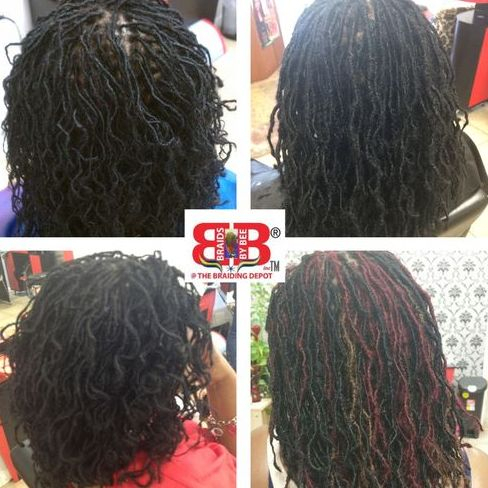 Bee finally came up with her own Brand of Human Hair to reinforce Dreadlocks as well as Create a full head of InstantLoc Dread Extensions which are permanent once installed. Sisterlocks Instantloc Dread Extensions started on natural hair or permed hair doesn't matter with this technique. Also edges may be short and Bee can adjust to make just as long as you want it. 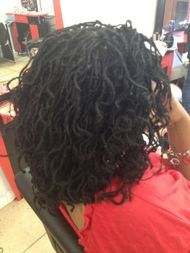 SisterLocks started with Human Hair added to there own hair to start the process. Bee calls her Locs InstnatLoc Dread Extensions to differentiate from the common hairstyle Faux Locs. SisterLocs is a micro size part style and small portion of hair taken to start each individual Loc. Each head takes a whole day sometimes two. ** Sizes of Sisterlocks may vary due to clients natural hair texture when starting, if theres no hair or permed hair will be the thinnest if your hair is natural and thick and a lot of growth they will look a little thicker. Sisterloc InstantLoc Dread Extensions was originated by Braids by Bee at The Braiding Depot inc. Bee uses this technique to start off natural dreadlocks for those who have natural long permed hair or broken damage hair and wants to start a new journey. 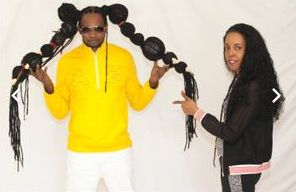 Sisterloc Dread Extensions is created instantly with the technique Bee uses. 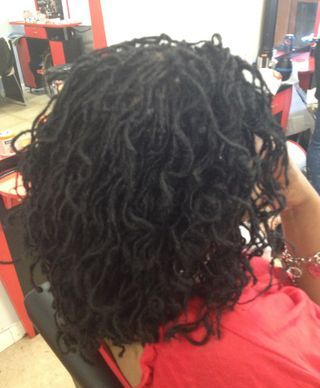 Once these extensions are added to your hair to create InstantLocs they are never removed. This grows with your hair, as your new growth starts coming out you re-twist roots. Roots will continue to grow just as normal Locs its your choice to interlock roots with crochet needle at this point or palm roll twist roots. Your hair will need reinforcements but only once a year to make sure your new locs stay long and healthy. 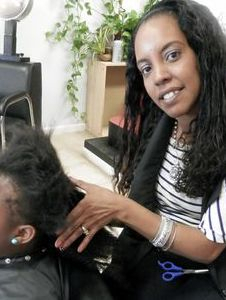 No age limit on when you want to starting your dreadlock Journey. Micro Size SisterLoc Instantloc Dread Extensions. Now some may say these are not sisterlocs cause size of dreads is not small enough. One must consider that yes this is normally true Locs are suppose to be skinnier, however that is without adding any hair to your own hair. Once we need hair to add on to your hair of course it will make the width of the dreadlock a tid bit bigger than the normal size. However keep in mind this is added on hair. When new growth comes in you will still have same parts and just continue to interlock your roots or palm roll twist just as you would normal dreadlocks. This explains why some pictures of these Locs may look bigger on photos but in person Locs are very thin and parted in Micro sections. Now Most clients love this method cause adding hair to already fragile hair just reinforces that your Locs will be healthy and grow as long as they possibly could by using this protective method. 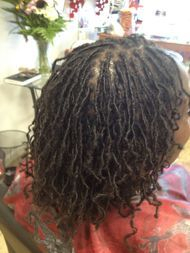 Sisterloc Dread extensions is a permanent look for those wanting to start there journey. Starting sisterlocks Journey with Braids by Bee technique of InstantLoc Dread Extensions technique. InstantLoc Dread Extensions™ is Braids by Bee Brand and Registered Trademark technique of installing Dreadlocks that becomes permanent once her technique is installed into your hair. This brand was originated by Benite Corion in the early 1980's when taking care of clients natural grown dreadlocks we experienced breakage, thinning, balding in areas that cause someone not to be able to wear there hair in styles they wanted. Now as you get older everyone knows your hair does not grow the same way and becomes thinner as you age. Well this is how I came up with InstantLoc Dread Extensions in came from me finding a solution for those that had natural dreads and needed a replacement or fixes that was never created. Well Bee not only created a solution and found the perfect solution but is able to create a full head of Dreadlocks that can be created from scratch from techniques I learned from repairing Real Natural Locs. With this method it was not detectable if I was to enter one or two false dreads into a head full. So with this idea. 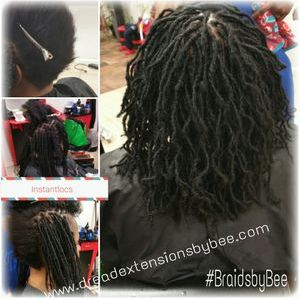 Bee created the term InstantLoc Dread Extensions for this form of dreadlocks. 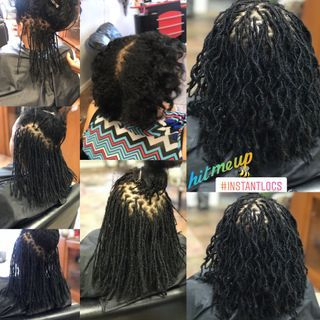 This is not Faux Locs or just simple Dread Extensions this is a brand originated from the stylist herself from years of experience of bandaging many clients locs till I found the undetectable solution. This solution blends well with your hair cause it looks just as natural and authentic as real dreadlocks. My InstantLoc Dread Extensions are permanent and done with highest quality of organic hair that is our trade secret to how our locks are genuinely authentic. Bee tells you how to keep up your dreadlocks and how to continue growth of your new journey. Clients that has had this done never cut it out, they may cut it shorter as there hair will grow faster now that you have Locks. However clients who invest in there hair journey are investing in the future of there new look. Braids By Bee™ starts journeys for those who have natural hair or permed hair. This client above had permed long hair before she started her journey of going natural. 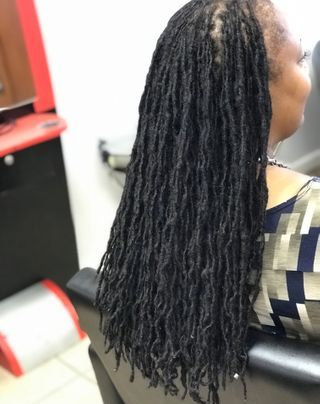 Sisterlocks Dread Extensions™ started with Instantlocs method and this pic above has been taken 3 years after installation was put in and started. BrotherLocs Instantloc Dread Extensions started by Braids by Bee @ The Braiding Depot inc. this style took two days. We can solve any issues that you may have starting dreads, or fixing dreads that have not formed properly. fixing broken ones that fell out from daily wear and tear. Fixing bald spots or hair loss in a particular area in your already grown dreads. There has not been any problems that Bee has not ben able to resolve. 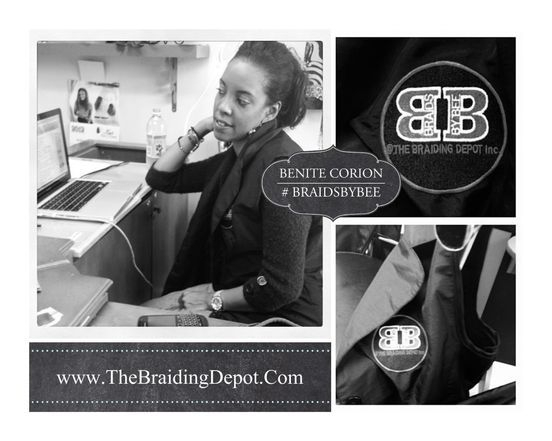 Clients fly from all around the world to see what Braids by Bee At The Braiding Depot inc.™ can do for them. Make that visit we are located in Fort Lauderdale, Florida.